In my opinion, boxers are more human than any other breed of dog, or animal for that matter. The broad range of emotions a boxer experiences are quite apparent. But, these human traits they display come with a price – boxer dogs have baggage. If you already own a boxer, you may have noticed that they have…umm…weaknesses. As people, we understand we are not perfect and are susceptible to weakness. Well, boxers are no different. 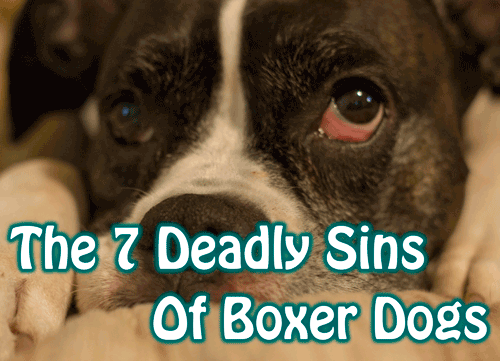 Here are the seven deadly sins of boxer dogs. We all know our boxers desire may different things. From your spot on the couch to whatever you happen to be eating, your boxer lusts for it. But what does your boxer really lust for? If your dog is anything like mine, it’s kisses. Oh, yes, the inevitable boxer slobber kiss. It can not be avoided and is rarely prevented. Whether you like to make out with your dog or try your best to avoid his advances, it WILL happen. Although boxers can be the most loving dogs on the planet, they are very greedy. Think about it. How many times has your dog wanted something that he didn’t need? Or taken something that wasn’t his? I can’t even roll over in bed without my boxer greedily sliding in, stealing my spot and hogging the blanket. Not to mention the little trick boxers pull by stretching their legs out, pushing you off your couch or bed (I know it’s not just me). It would appear this boxer is taking it one step further, stealing the poor cat’s bed. Everyone knows that boxers envy. What they are envious of just depends on the moment. On any given day my pooch can suffer from cat envy, dog envy, couch envy, spaghetti envy, tic-tac envy…you get the idea. Yes, boxers are an envious bunch. If you’ve ever owned more than one at a time, you know exactly what I’m talking about. You’d better not pet one without petting the others. There’s one thing I know for sure: if you have multiple boxers, NEVER walk one without the other! Although your dog may not throw fits of rage every day, boxers may be internalizing some serious wrath. We see the signs everywhere. From their looks of contempt while you wolf down your dinner to their bottled up jealousy of your other pets. For as high energy as boxer dogs are, they sure know how to be lazy. How many times have you found your boxer crashed out on the couch and had to check his pulse? Pride can be a great quality to have. It is great to be proud of yourself, your family, friends, etc. All dogs are known for their limitless desire for human food. Please share your boxer’s deadliest sin in the comments below. Also, feel free to share this post with your friends!